The Bengal tiger is the national animal of both India and Bangladesh, and the most numerous tiger subspecies. Male Bengal tigers measure an average of 9 to 10-feet long, including their tail, and the tail is typically 33 to 43-inches long. Their weight ranges from 395 to 570 pounds. But using the smallest building blocks in the world, you can build your own tiger that fits in the palm of your hand! These building blocks enable you to execute even the finest details like never before. 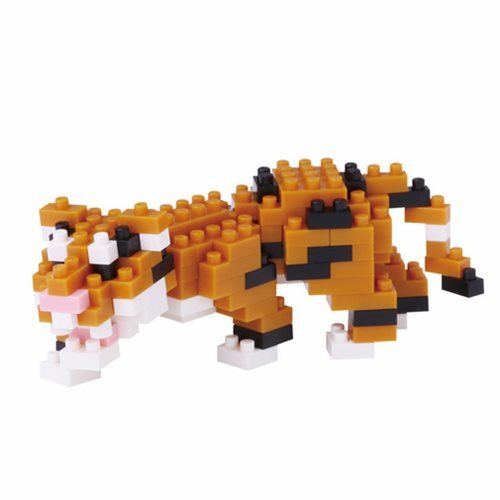 The Bengal Tiger Nanoblock Constructible Figure is challenging fun for all the construction enthusiasts in the family! Ages 12 and up.